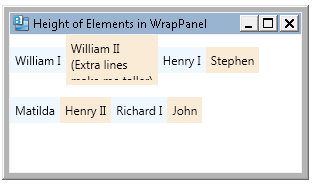 By default a WrapPanel will size it’s rows (in Horizontal orientation) or columns (in Vertical orientation) to the size of the tallest/widest element. This means that no element is ever clipped due to row/column sizing, though they may be clipped if the WrapPanel itself has an explicit size specified. Child elements can also be clipped if an element ends up larger than the specified ItemWidth and ItemHeight properties. In the example below, ItemHeight has been set to 50, which is shorter than the Label that has three lines.